Chro Noz, the time travel drug. Just pop a capsule, take aim, and the next thing you know, you’re there – wherever, nay, whenever you’ve aimed – within the parameters of your own existence, of course. Addictive as all get out. 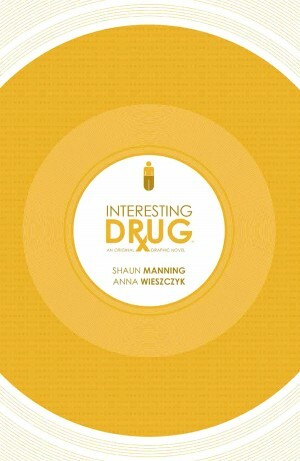 It’s becoming a problem in Interesting Drug, Shaun Manning’s new graphic novel from BOOM! imprint Archaia. Once a promising scientist, now a college dropout, Andrew Smith is wasting his life. He’s been working at Best Buy for the past seven years, and in his free time he watches television and listens to Radiohead. When Tristram shows up, all sinister smiles, and soliciting Andrew’s help, things get really weird, really quickly. Andrew has some regrets and wrongs to rectify, and, as it turns out, so do the proverbial masses. Chro Noz is a huge hit, come epidemic. And, of course, there are consequences. Perfectly complementary to the eerie, mind-bending subject matter, Polish illustrator Anna Wieszczyk’s mixed media approach includes watercolors, expressive line work, and some fun photo-collage. The characters resemble 80’s new wave band members and the world they inhabit feels explicitly permeable, flimsy, even. Philosophical science fiction at its best, Interesting Drug considers the simultaneous existence of alternate realities, the age old problem of human intervention, and its fundamental cause – the dark side of mortality and limited knowledge. Even the best laid plans go awry, as it goes, and, let’s face it, humankind is not comprised of total benevolence. Life is more complicated than that.